Ascending. : moving upward; rising. International DJ’s, heterogeneous style, gathered at the same venue for a path to darkness. Starting in the light of house music, cruising through minimalist sounds until reaching the obscure Techno, it’s an ascension of BPM and brutality, where many kind will be explored. 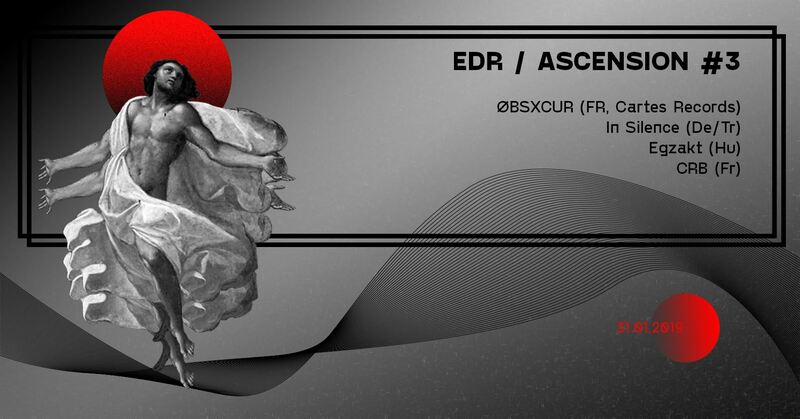 Originally from Lyon, ØBSXCUR refuses to stay still and is in a perpetual chase of sensations. Fueled by an inspiration from Londonian culture, he is an explorer at heart and gives us in return acidic techno, producing stimulating and innovative music. His style of techno, both rich and dynamic, is as dark as it is melodic and aggressive, and leaves crowds to the mercy of unexpected pulsations. It is by mixing his inspirations from rock music with his more electronic tendencies that he leads us to a bold auditory experience. His kicks and melodic synthesizers have the distinct ability to promise us a travel through sound of the highest quality. In short, ØBSXCUR will give you techno that has an acid, energetic and ascending feel, all on a consistently dark and obscure background.